A block of two, a top cut off from a sheet of 12. Denomination of 8.00 kr and additional of 0.50 kr that goes to the charity. In her capacity as patron, H.R.H. The Crown Princess appears on this year’s charity stamp from The Danish Heart Foundation. The charity stamp was unveiled Sunday, 10 June by The Crown Princess and the photographer behind the portrait, Steen Evald. The profit from the sale of the stamps goes entirely to the foundation’s top concerns. Every year, more than 7,500 Danish women die of cardiovascular diseases. That means one women is dying almost every hour around the clock. Contrary to what most people believe, cardiovascular disease is one of the most common causes of death amog women in Denmark, and causes more deaths among women than men. “Cardiovascular disease is one of the most frequent causes of death in Denmark. As patron of The Danish Heart Foundation, I hope that the annual charity stamp can help shed more light on this undesirable statistic. 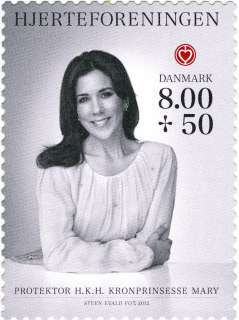 A statistic which must be addressed, and which requires that we, through research, obtain more knowledge about the cause and treatment of cardiovascular disease,” says The Crown Princess about the background for her patronage of The Danish Heart Foundation and the picture of her on this year’s charity stamp. The charity stamp supports, among other things, research on cardiovascular disease among women. Cardiovascular disease affects women as frequently as it affects men, but as the statistics today show, men have a greater chance of survival. The Crown Princess has been patron of The Danish Heart Foundation since 2005 and is also a lifetime board member of Crown Princess Mary’s Heart Fund, with supports research on cardiovascular disease among women. This year's charity stamp supports the Heart Foundation's work, which among other things aims to ensure that more women in Denmark survive if they get a cardiovascular disease. With 121,000 the Heart Foundation (Hjerte-foreningen) is one of the largest disease preventing organisations. The foundation was established in 1962 ans thus celebrates its 50 year anniversary in 2012. It is the second time in Danish stamp history that a charity Stamp's surcharge goes to the Heart Foundation. The last time was in 1984, when Rasmus Nellemann designed a stamp depicting an electrocardiogram. Since 2005, Crown Princess Mary's Heart Foundations, which supports research into cardiovascular disease among women.